Google My Business (GMB) is a tool that allows you to manage how your business shows up on Google Search and Google Maps, making it much easier for customers to find information about your business online. The information listed includes hours of operation, directions, and contact information. If you want to be found online in a local search, it’s essential that your business is listed under GMB. Ensure that your Google Page is up-to-date with the correct information and optimized for the best results, which can make a big difference in not only website traffic, but actual store visits as well. GMB encourages both online and offline success for your business. To get started, create a free business profile in Google. In order to do so, you’ll need a Gmail account. As of now, there is no maximum number of listings per account, so you can manage all of them through one profile. Begin by typing the name of your business. If there are no listings, you’ll have to create a new one, but if it already exists, you will have to claim it instead. The process is rather simple: you’ll start by typing in all the requested information like business’ address and contact details and category, which you’ll select from a list of options. Once your business listing has been created or claimed, you’ll then have access to the GMB dashboard. This is where you can create posts or offers, add photos, update information, and check your audience insights. Home: The home section is where you’ll get an overview of what’s happening with your business’ listing. This is where you can review the most recent customer photos, respond to reviews, and manage your posts. Posts: This section is where you can create posts for your listing. Posts allow you to share interesting or new information with potential customers like upcoming events, offers, and featured products and deals. It’s a good idea to include the products or services you offer, as they will be displayed with a ‘sold here’ label when people search for them as a keyword. In order to best optimize your GMB post, you want to make sure you’re always including an image and keeping the topic interesting and related to your business. GMB posts can be up to 1,500 characters, but it’s more effective to keep it short and to the point. Ensure you’re changing up the posts frequently, as they only last 7 days. Info: The info panel is where you update your local business’ information. This includes NAP (name, address, and phone number), website URLs, and business attributes. You can also edit your business description in this panel. Updating your business hours during holidays and long weekends is important as many potential customers will often search for a local business’ holiday schedule, creating a trustworthy source for clients. It’s a good idea to add your products and services in this section, because not only does it help with visibility on desktop searches, it also allows your listing to appear in voice search queries when customers are using devices such as Google Home or Alexa. Insights: Online data is vital information for local businesses. You can utilize this to know what’s working and what isn’t, which translates into getting customers through the door. The insights panel is incredibly handy to see how your business is doing in terms of searches and viewers. You can look at insights for keywords, photo views, and customer actions. Reviews: With 63.3% of consumers stating they are likely to check online reviews on Google before visiting a business, it’s clear that reviews can make or break a local business. Negative reviews drive customers away, so it’s important to check them regularly and respond in a timely manner. Your reviews will be organized by most recent, reviews you’ve replied to, and reviews you have not replied to. When you respond to a review, the reviewer will be notified. Messaging: In GMB, you can communicate directly with consumers. This is where you can respond to any questions or messages from potential customers. Messaging is also accessible on the GMB app that is free to download on mobile devices. Photos: Images and videos will help your GMB listing get noticed. You can manage these directly through the photo panel, where you can see all content uploaded by customers, along with how many times the photo or video was seen. Website: If you’re getting started and don’t have a website yet, you can manage and optimize a Google-built site in the website panel. Although this will do the trick to start, it’s highly recommended that you create a full, professional site to display your products and services. Other Features: You can also control who has access to your listing and what kind of access they have. You can add other locations for multi-location businesses or franchises, which will allow you to view all your locations’ listings and any recent updates. For opening soon locations, Google My Business enables you to announce the opening of your business right in Google Maps. This feature allows you to build awareness and prep for opening day by broadcasting to potential customers when you will open, your hours, and what consumers can expect. Just like your website, optimizing your GMB page is essential if you want to appear in local search queries. 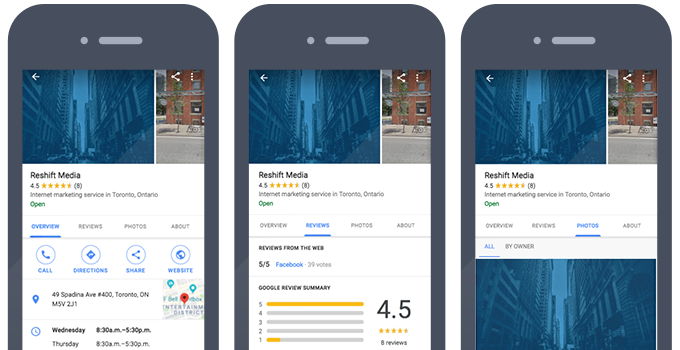 Google is helping people find businesses that are nearby, which means the closer the searcher is to your business, the higher you can appear in search results. For the best optimization, your business should also be listed on other third-party directory listings (Yelp, Trip Advisor, City Search) and other high-quality sites. For the best results, your NAP information should be consistent across all these directories, as well as on your website. Google My Business helps local companies get more visibility and search engine accuracy. With 4 out of 5 consumers using search engines to find local information, GMB has the potential to help you reach new customers and provide them with accurate information. Signing up is free and only takes a few minutes, making this tool incredibly valuable and essential for all local businesses.